Organic baby food, like all other true organic products, is produced without harmful substances such as pesticides, chemical fertilizers, hormones, antibiotics, or other unnatural additives. When the concept of organic eating first became popularized, it seemed like a natural step to provide this food to infants, toddlers, and children in general because of how dynamically the benefits of eating organic can positively affect young people’s health. 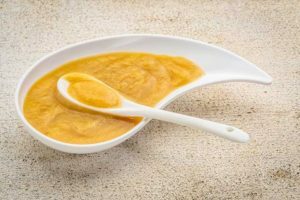 Infants and toddlers, in particular, can be especially susceptible to harm caused by pesticides or other additives found in non-organic baby food. Because of this, creating an organic diet for babies is one of the most thoughtful ways a parent can effectively improve their child’s health from infancy into toddlerhood and beyond. Beyond being environmentally friendly, this could greatly cut down likelihood of sickness and disease and shield them from ailments ranging from the common cold to diabetes. Organic, Safe Dishware: The Next Logical Step? As a parent, you’d be extremely disappointed to find out that the good being done by feeding your children organic baby food was being negated by the use of unsafe dishware. This scenario plays out every day though, as the very devices you are using to serve this nutritious food may be filled with chemicals and other potentially harmful substances such as lead, BPA, PVC, phthalates, and melamine. These toxins have been linked to the most grave and insidious of diseases, and have no place being around infants and toddlers – let alone when you have already gone great lengths to institute an organic diet in your child’s life. Luckily, there is an answer to this problem in the form of organic and other safe dishware, which is aimed directly at folks looking to maximize the health benefits of organic baby food. After all, it would seem outright contradictory to simply look the other way when it comes to dishware after actively steered away from potentially harmful substances in baby food itself. Looking beyond organic baby food itself, here are a few things to keep in mind and look for when selecting safe dishware and containers for your infant or toddler. Dishware utilizing quality food-grade stainless steel is generally very anti-bacterial and also does not leach chemicals from cleaning agents. As far as plastics, things to look for and avoid are anything with BPA, PVC, and phthalates. Typically, companies that produce plastics free of these products will directly advertise this to you and it should be easy to spot. To find out more about maximizing the results you get from organic baby food or to learn about Kangovou, click here to visit our website. To learn more about Kangovou’s products and how they can provide your family with non-toxic, BPA free containers and dishware, check our our full product line here.